Normally you need to test and treat your Spa constantly to keep the water free from dangerous contaminants, but there is a big problem with the way most Spas are treated. Many of the chemicals used to treat your spa are toxic. They use large amounts of harsh chemicals like chlorine, bromine and hydrogen peroxide. The elevated temperatures of your Spa cause these chemicals to be more active and an even greater threat to you. High Spa temperatures open your pores and allow chemicals to be absorbed by your skin and bloodstream. The chemical vapor caused by the temperatures of your Spa are breathed in, damaging sensitive lung tissue. No wonder 80% of people who use Spas have some kind of adverse reaction like red irritated eyes, itchy dry skin, and rashes. 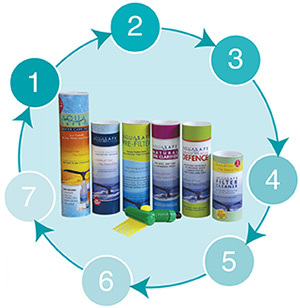 AquaSafe Circle of Care offers natural, safe, chemical free products to maintain clear and fresh water for hot tubs and swimming pools in an easy 7 step, 90 day system. This remarkable formula keeps your water clean, sparkling bright and fresh with no harsh chemicals or irritating odours. These powerful yet gentle enzyme cleansers remove contaminants to eliminate unsightly scum and foam and prevents scale or mineral deposits from forming. 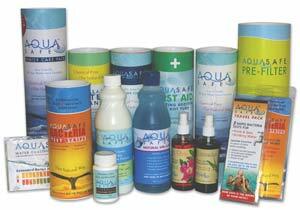 With no corrosive chemicals in AquaSafe 90 to cause rust, stains or tainted water, your pump, filter, heater and every part of your spa in contact with the water will look better and last longer. FREE from daily maintenance and testing – NO more test kits! Save water, don’t waste a valuable asset – Drain your spa water directly onto your lawn or garden!